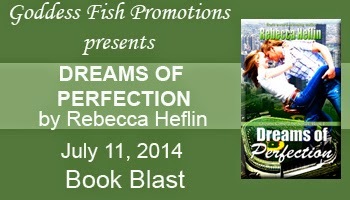 Congratulations to the tour winners: Kathy P. and Mai T.
Goddess Fish Promotions is organizing a Virtual Super Book Blast Tour for Dreams of Perfection by Rebecca Heflin, a Contemporary Romance available now from Soul Mate Publishing. The Super Book Blast Tour will take place on Friday, July 11, 2014 and is limited to the first 50 people who sign up. This tour will not include interviews or guest blogs; however, a blurb, excerpt and author bio will be provided to every host for inclusion on their blog. If you’d like to review this book in conjunction with a promo post, please see the Review Only Tour, here. Rebecca will be awarding an author-graphed ebook to two randomly drawn winners via rafflecopter during this tour and the NBtM Review tour, here. What if perfection isn’t truly perfect? Best-selling romance writer, Darcy Butler, is holding out for perfection in the form of her own carefully-crafted heroes. Once blissfully engaged to be married, Darcy’s post-traumatic commitment phobia is depriving her of the very thing she wants most: her very own happily-ever-after. Now, here she is just six months shy of her thirtieth birthday, and not a Prince Charming in sight. Successful lawyer, Josh Ryan, is the boy-next-door with a soft spot for the less fortunate, and Darcy’s best friend without benefits. Darcy often comes to him lamenting her love-life, or the lack thereof, whereupon Josh patiently doles out his sage advice. Problem is Josh is in love with Darcy. I'd love to be included. I could do the book blast. I will host at Books to Light Your Fire. Thanks! I can host the book blast - Jersey Girl Book Reviews. I would love to host. I would like to host the Book Blast. book blast only for me, please. Sign me up, please! I also signed up for the review tour. Brooke Blogs can post this SBB. Our Wolves Den can participate. I can host the blast on Two Ends of the Pen.